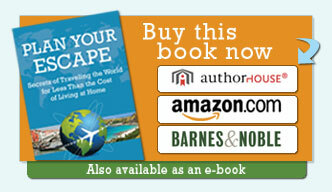 The Dunlaps would love to hear your comments about your travels and their world travel book and TV show: Plan Your Escape®. The Dunlaps have an interesting human interest life-changing story – traveling the world for the past 3 years visiting 100 countries and 44 U.S. states in their lifetime! They are experience travelers (100 countries), award-winning photojournalist/blogger, featured speakers at large travel shows, travel TV hosts (Plan Your Escape® TV) on the CW network, and travel columnist for the Huffington Post. The Dunlaps have a sincere desire inspire others to travel and help them to travel and see more for half the cost from weekend getaways to longer vacations and trips, experience more adventure and romance with comprehensive planning tools & checklists, and safely realize their travel dreams.